Scotch played a prominent role in the life of the celebrated actor and bon viveur – and may have saved him from a fate worse than death while skiing in the Italian Alps. Iain Russell reports. Whisky, the hero: Scotch played a major role in Niven's life, helping to save it more than once. 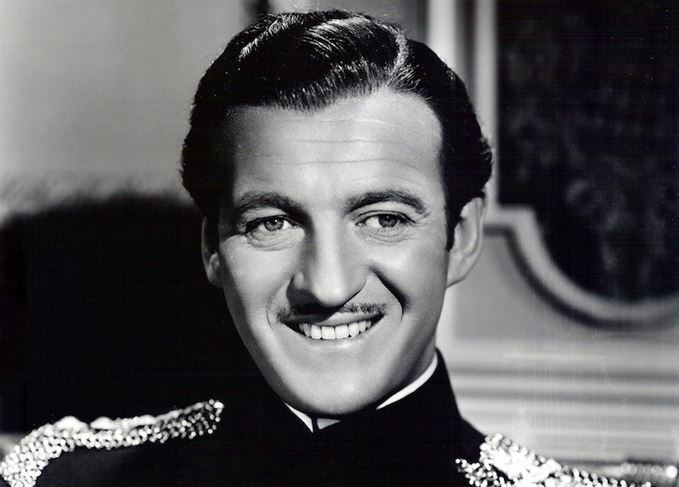 David Niven (1910-83) was an Oscar-winning English actor, famous for his roles in films such as Dawn Patrol and Around the World in 80 Days. He was also a celebrated author and raconteur. The great Cary Grant once offered to hypnotise Niven to ‘cure’ him of his love of Scotch. Niven politely declined the offer and Scotch remained his favourite tipple until the end of his days, featuring prominently in several of the key moments in his eventful life. Niven was born in London, the son of a big-spending but impecunious Scottish father and a beautiful but slightly batty French mother. He joined the British Army and attained the rank of Lieutenant in the Highland Light Infantry. While holidaying in the US in the early 1930s, near the end of Prohibition, he partied with rich young Americans in fashionable speakeasies such as the 21 Club in Manhattan. After sampling the excitement of American High Society, Niven became disenchanted with Army life. In 1933 he was charged with insubordination and was placed under close arrest – that is, confined to his room under the supervision of a fellow officer. He and his ‘guard’ downed a bottle of whisky and, when the latter went to the toilet (with a nudge and a wink), Niven promptly leapt out of the window and drove away. He fled to Canada before he could be court-martialled, resigning his commission by telegram. Niven drifted to the US, and found himself back at the 21 Club. Prohibition had recently been repealed and the owners, Jack Kriendler and Charlie Berns, were branching out into the wine and spirits distribution business. They had made many useful contacts during the ‘good old days’, including Jimmy Barclay, the owner of the Ballantine’s whisky brand. Niven was employed to win orders in ‘his’ patch of Manhattan for Ballantine’s and a range of wines and spirits, on a salary of $40 a week plus 10% commission on sales over $400. Unfortunately, Niven was not a natural salesman and was easily distracted from work, coming close to being ‘bumped off’ after seducing a gangster’s moll. Kriendler and Berns were rarely called upon to pay him commission and he was sacked after a few months. His mugshot, taken the day he started work for the firm, was hung on a wall in the 21 Club above the legend ‘Our First and Worst Salesman’. After more adventures, Niven became an actor in Hollywood where he mixed and drank freely with the rich and famous. Whisky played a great role as a social lubricator, especially when carousing with the likes of Errol Flynn, John Barrymore and Humphrey Bogart. When he visited the great newspaper baron William Randolph Hearst’s fabulous castle at San Simeon, Niven was well aware of the billionaire’s stern disapproval of drinking. To Hearst’s sons’ delight, he smuggled bottles of Scotch into a cottage in the vast grounds, where all participated in some serious ‘pre-loading’ before dinner with dad. At the beginning of the Second World War in 1939, Niven volunteered to re-join the British Army, seeing active service in Europe and rising to the rank of Lieutenant Colonel. After the war, Niven returned to the US and to the life of a movie star, playing roles such as that of James Bond in Casino Royale. His success led to many lucrative advertising deals and his 1970 television advert for Passport Scotch is still available on YouTube. He also found fame as an author, particularly for his autobiography The Moon’s a Balloon, containing witty tales of his adventures as an actor. One of those stories concerned the day that whisky saved his manhood. While starring in the first The Pink Panther movie in Italy, Niven had to film a short scene skiing in the Italian Alps. He went out on the slopes with an instructor the day before shooting began, wearing only the very stylish (but very thin) ski outfit he had to wear for the scene. It was a rash thing to do, for temperatures at the top of the mountain had dropped far below freezing. Inevitably, his inadequately insulated extremities ‘cooled’ and he realised he had lost all feeling in an area of the body that was rather important to his love life – the dread symptom of impending penile frostbite. Cupping his hands over the affected area, Niven raced down the slopes and was driven off at speed by a group of ski instructors to the bar of a fashionable hotel in the nearest ski resort. A brandy glass was filled to the brim with whisky and taken to the lavatory where, with the assistance of his Italian rescuers, Niven’s frozen blue appendage was inserted into the whisky to thaw. Fortunately, he tells us, there were no lasting consequences. Many consider that this story is a classic example of a Niven ‘tall tale’. My own opinion? Don’t try it at home! Towards the end of his life Niven was diagnosed with amyotrophic lateral sclerosis (ALS), also known as Lou Gehrig's disease – a debilitating and uncurable condition also currently affecting whisky heroes Parker Beam of Heaven Hill in Kentucky, and Glenfarclas' James Combe. As Niven's health faded he refused to be admitted to hospital, choosing rather to spend his final days at his chalet in Chateau d'Oex, Switzerland surrounded by family. Last year over $115m was raised for the ALS Association though the viral ice bucket challenge. More information and donations can be found at the charity's website, www.alsa.org.